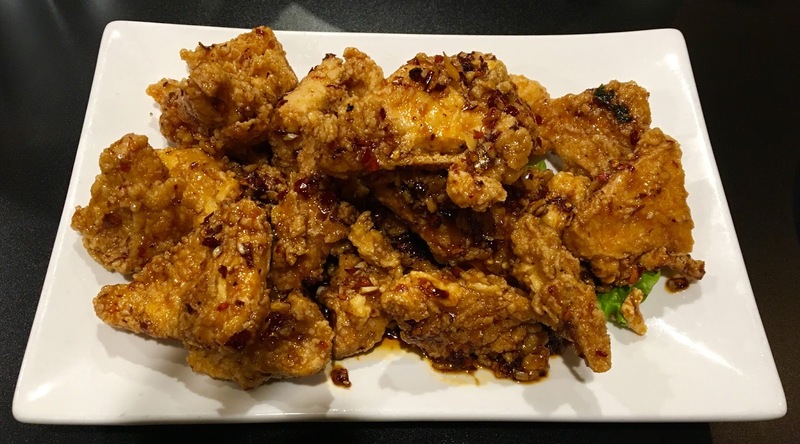 I'm actually kind of embarrassed to write about Pho Fresh in Rancho Cordova, as I'm sure I'm probably the only vegan in the Greater Sacramento area who had never been to this incredibly vegan-friendly restaurant until a few days ago. But since my friend Melissa and I went to dinner there Wednesday night and I was actually able to experience it first-hand, I wanted to tell you all about it. Pho Fresh is not a vegan restaurant, but they offer an entire vegan menu, complete with appetizers, rice paper rolls, salads, banh mi sandwiches, soups, rice plates, noodle plates, and dessert. My biggest problem, of course, was trying to figure out which items I most wanted to try. I'm a sucker for fried tofu, so I decided to start with one of the stir-fried tofu appetizers (yes, they have more than one!) The tofu is dipped in batter and then fried, and there are three different flavors to choose from. I went for the sweet & spicy one, and couldn't believe the huge pile of fried tofu that was placed in front of me. It was wonderful! For my entrée, the only question was whether I wanted a rice dish or a noodle dish. 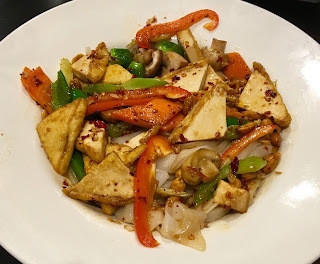 It felt like a noodle night, so I ordered the kung pao garden noodles, consisting of thick rice noodles, tofu, peanuts, bell pepper, and mushrooms. Again, the portion size was quite large, so I had some great leftovers for a couple of days after this meal. I think I could probably go to Pho Fresh every night for a month and eat a different vegan dish every single time, the choices are so numerous. If you're one of the rare few who haven't been there yet, you owe it to yourself to check it out. Pho Fresh is located at 10673 Coloma Road in Rancho Cordova, and their phone number is 916-706-2523. They don't appear to have a website, but their Facebook page can be found at https://www.facebook.com/phofresh2u/. The restaurant is open Sunday through Thursday from 11:00 a.m. to 9:00 p.m., and Friday and Saturday from 11:00 a.m. to 10:00 p.m.
Blogging will resume later this month. Follow me on Facebook and Instagram for updates.